If money is tight this holiday season, it’s time to consider cutting back on your holiday spending. Take a minute to read through the following suggestions. Saving money at Christmas time is probably easier than you think! It’s important to set a budget for yourself before buying gifts. It’s easy to spend too much when you’re not keeping track of your purchases. More importantly, it can be financially dangerous for people who find themselves living paycheck to paycheck. Set a monetary limit for yourself and stick to it. This will help to ensure you don’t go overboard while shopping and also ease the financial stress Christmas tends to bring with it. While the holidays seem to be all about excess, they don’t have to be. Do you usually buy tons of toys for your kids and extravagant gifts for friends and family? Do you make mountains of food that ends up going in the trash because everyone is too stuffed to eat any more? Do you decorate every nook and cranny of your house, only to dread the part where the season’s over and you’re forced to take all of it down again and store it in too little space? Do you have to do any of that? No, you don’t. Take a hard look at your “usual” holiday habits and figure out which traditions mean the most to you and your family, then cut the rest out. If you’re planning to cut back, let your friends and family know in advance so they have time to adjust their expectations. Discuss what your plans are and why you’re making changes. Most people are on automatic pilot when it comes to holiday planning — some are even in automatic crisis mode. They do what they do because it’s what they’ve always done, or because it’s what they think everyone expects them to do. If you bring up the topic with honesty and sincerity, you may be surprised by the responses. Once the questions have been asked, you’re opening up the possibilities of doing things differently. Thanks to online shopping, you can now even do your Black Friday shopping online and avoid the stores completely. Use sites like Ebates to find coupon codes and get cash back on purchases you’re making anyway. Look for online sales and specials — many retailers have lots of online sales during the holiday season. Another pro to shopping online: you can resist those impulse purchases that jump in your cart while you’re browsing the store. You can have gifts shipped to you for wrapping and personal presentation, or you can have the gift shipped directly to the giftee if they live out of town, and save yourself a trip to the post office plus the extra costs of shipping. I love shopping on Amazon and using Amazon Prime for this! Just be sure to order early enough for the gifts to be delivered on time! DIY or “do-it-yourself” gifts are a very heartfelt, popular way to express how you feel about the important people in your life. You’ll find a wide variety of customizable ideas for DIY projects, as well as tutorials on how to make them, on popular websites like Pinterest and Facebook. Baking treats for the people on your gift list is also a greatly appreciated, age-old tradition. You can keep it simple and make a communal plate of treats for your co-workers, or personalize things by whipping up some of each individual’s favorite sweets. In most cases, buying the materials or ingredients needed for DIY gifts and baked goods will cost significantly less because you have to create the product, rather than buy one that’s already made. Try hosting a potluck dinner this year by simply asking your guests to bring the dish of their choice. Since the host is typically expected to provide the main course, think about requesting side dishes and desserts. Leave the choice of what to bring to the people attending. Part of the fun of a potluck is the variety of dishes. This not only relieves much of the stress of planning dinner for a group of people, it typically saves you a ton of money without sacrificing the quality or quantity of your holiday meal. Secret Santa is a fun tradition during the holidays. It is most commonly implemented among friends and co-workers, as a means to save a substantial chunk of gift-giving change. Because Secret Santa involves drawing a random name from a collection of participants, you’re limited to buying just one gift for the person whose name you drew, rather than a gift for everyone in your circle. 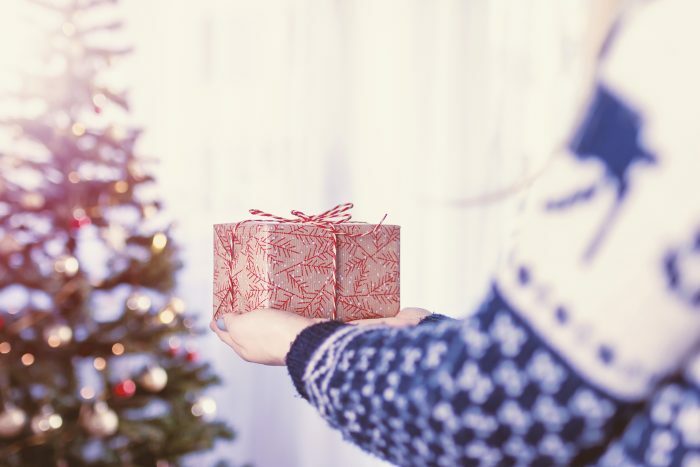 While it may be difficult to get young children on board with the idea of receiving only one gift for Christmas, it’s often a home run for families with children who have grown up and understand the importance of limiting spending during this time of year. For many people, shopping for Christmas gifts all year round is arguably the best way to cut costs on holiday spending. This reduces much of the frustration of holiday shopping, and also saves you from buying gifts at inflated (pre-holiday) prices. While it might be a little late to put this one in action right now, keep it in mind for next year. Year-round shopping allows you to take advantage of amazing sales you can generally find throughout the year. These are just a few easy ways to cut your Christmas spending without feeling like Scrooge. Remember, it’s not the amount of money you spend, it’s the thought that counts! What strategies do you have to save money at Christmas? Join my free 5-Day Christmas Challenge! Get 5 days of holiday tips and tricks designed to simply your Christmas. You will also receive my periodic emails with tips, tricks, and more freebies. Unsubscribe at any time.